The first anniversary celebrations for PUBG MOBILE is scheduled tomorrow. PUBG Mobile continues to surprise us. The game has now announced a collaboration with Norwegian DJ and record producer Alan Walker. Alan Walker's new song "On My Way" is the theme song for the first year anniversary celebration. Players can listen to the new single in the game right now. The song will be released for the rest of the world across all streaming platforms tomorrow. 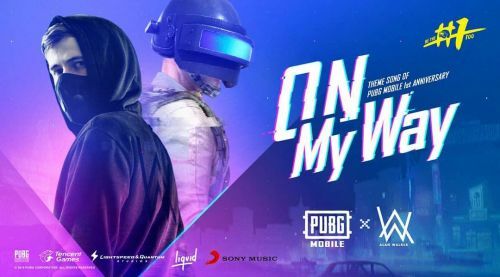 This collab was first teased back on 11 March when PUBG Mobile posted a picture on Instagram with the silhouette of a person who resembled Alan Walker. Instantly, fans began to speculate whether the famous DJ is actually doing a collaboration with PUBG Mobile. Unless you have been living under a rock, you must be knowing that PUBG Mobile will be celebrating the first anniversary of its release tomorrow. The waiting lobby in the game across all maps have been decorated for the same. The game has been teasing the celebrations for a couple of days now and we just have to wait one more day to see what is in store for us. The update accompanying the 6th season of the game dropped today, which has a bunch of new and awesome content with it. This includes a new gun and vehicle, some changes to the Survive Till Dawn Zombie mode and much more. The main highlight is definitely the dynamic weather which is coming to Erangel and Miramar. As of the time of writing of this article, the new season had not officially been released. You can read more about the update 0.11.5 here. The complete patch notes can be read in the official site here.